Is ‘Hack-a-Howard’ strategy the next ‘big’ thing in NBA this season? A few years back we had “Hack-a-Shaq,” a late-in-the-game strategy where teams would intentionally foul Shaquille O’Neal hoping he would miss free throws as teams tried to make up deficits in the fourth quarter. It appears a new strategy focused on intentionally fouling Houston Rockets center Dwight Howard may be fast gaining steam as the NBA 2013-14 season gets into full swing. In Thursday’s game between the Rockets and Los Angeles Lakers, the Lakers intentionally fouled their former center hoping the charity-stripe challenged Howard would miss free throws thus giving them a “defensive stop” and a chance to score. The strategy worked as Howard for the game made only five of 16 free throws in the Lakers one-point (99-98) win over the Rockets. The Lakers’ success with this strategy may prompt other teams to try the same ploy in close games this season as they look to beat Houston. This strategy got me thinking about NBA big men who would never be the victim of this Hack-a-(fill in the blank) game plan. The first name that came to mind is Dirk Nowitzki. The Dallas seven-footer is recognized as one of the best shooters in the game, let alone the game’s best shooting big man. A closer look at some stats confirmed my opinion. Based on NBA players 6-foot-10 or taller with a minimum of 1,000 career free throws attempted, Nowitzki has the best free throw percentage at .878. Here’s a look at the players 6-foot-10 or taller (minimum of 1,000 free throws attempted) who made 82 percent or more of their free throws. So which players have probably been the focus of a “hack-a” strategy during their NBA careers? Following are the players at the other end of the free throw accuracy scale… those players (6-foot-10 or taller with 1,000 minimum free throw attempted) with the worst career free throw percentages. Where does Dwight Howard rank on this list? 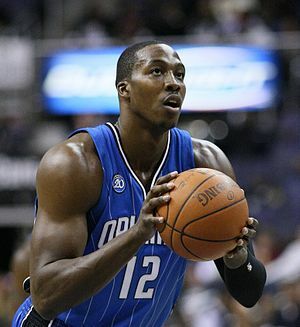 Howard is currently 12th in this ranking with a career free throw percentage of .576. Ron Hoppe must be disappointed in Howard’s approach to free throw shooting!! He’d have him running lines for all those misses!! Thanks for the walk down memory lane! Hope you are doing well.